There are three ways into this kitchen, from both sides of the island and through the rear laundry entry concealed within the cabinetry. 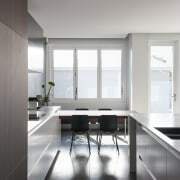 A new kitchen in a modern extension to a heritage home often has to respond to two aesthetics furthering the clean-lined appeal of the addition while linking with the residence's classic origins. Here, a well-chosen tile helped bridge the generations. The minimalist kitchen forms part of a clean-lined addition to an historic cottage. Lead designer Darren Genner and the team at Minosa undertook the kitchen together with the house renovation, and had already used an unusual Italian 3m x 1.2mm, lace-patterned tile to add a touch of modernity to existing bathrooms at the front of the cottage. The tile comes in eight harmonising patterns. And Genner was also able to use the same tile as a backdrop for the kitchen to converse effect. Here, its delicate pattern offered a classic accent in the context of the modern spaces. 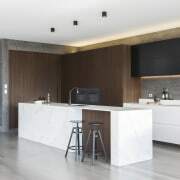 Besides playing to the old and the new, the kitchen had to achieve impact, be well organised, have a long island and include a discreet entry to the laundry behind. Genner says other owner requirements were the use of high-quality materials and fittings, working with immovable plumbing, and incorporating a breakfast area. 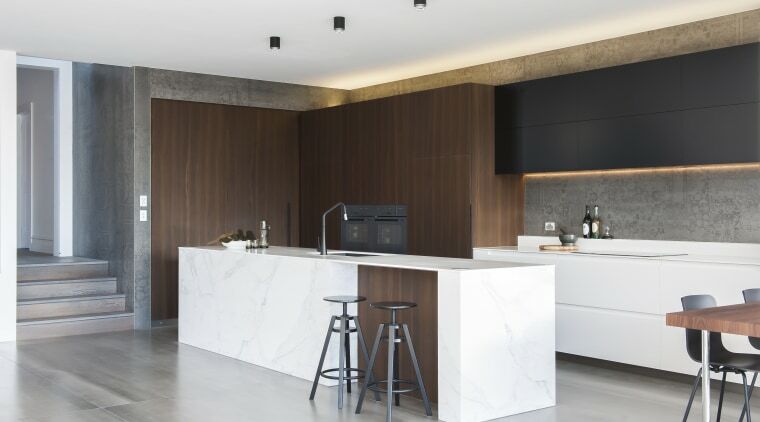 "To address the organisation of the galley kitchen and provide a hidden entry to the laundry, the tall pantry, refrigerator and oven towers were positioned next to the laundry access," says Genner. 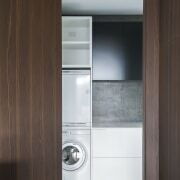 "All these elements the cabinetry, the laundry wall and laundry door were finished in the same veneer, concealing not only the laundry but also the pantry and fridge." 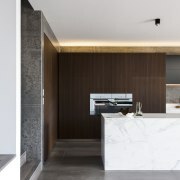 The remaining wall space was utilised for the cooktop and prep bench. Ample storage is offered by the deep underbench perimeter drawers and upper cabinets. The overhead cabinets operate electronically. Utilising Blum Aventos, the doors lift and fold up with the touch of a button. 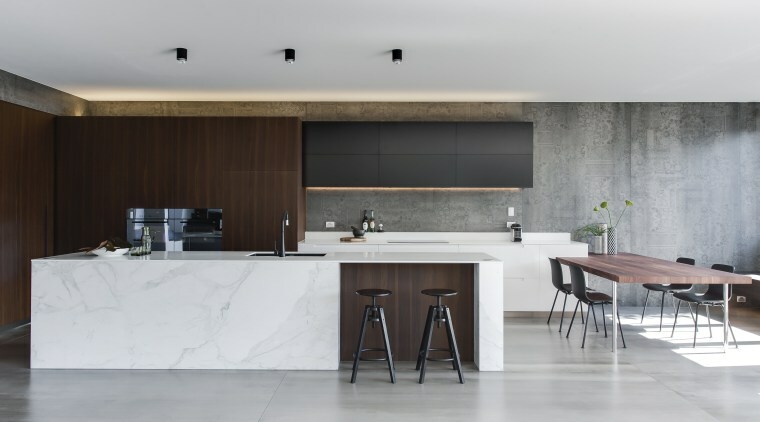 The darker overheads also conceal the range-hood, ensuring the kitchen's clean lines and furniture-like appeal remains intact. One challenge for Genner was his late engagement. 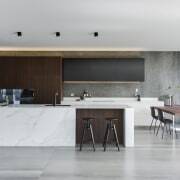 His work on the design began after the concrete floor slab had been poured, so the sink waste had already been locked into position on the island. "Luckily the clients' request for a long island was achievable and we were able to position the double bowl sink in the ideal position along this to meet the drainage." 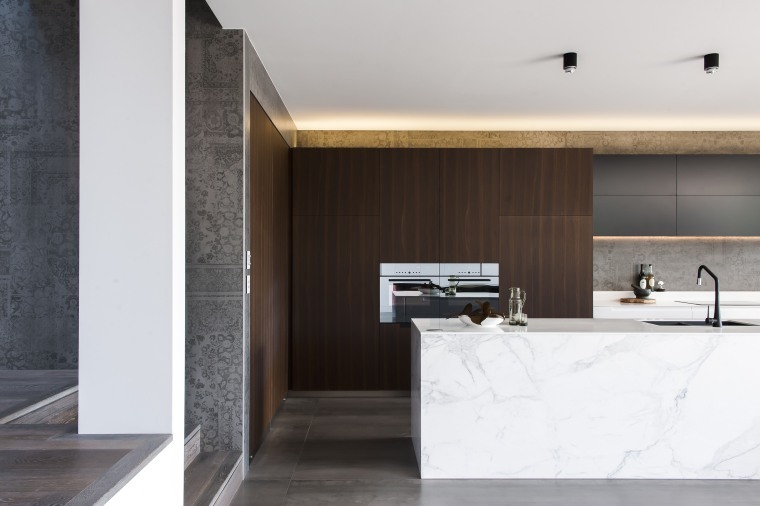 This contemporary kitchen provides a sculptural focus for the adjacent spaces. The island also houses the dishwasher, recycling bins and further deep storage. "An open section was incorporated into the island, with stools in front, creating an area for breakfast or chatting," Genner says. "And a wooden dining table was added at the end of the space. 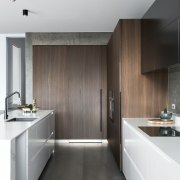 Its solid walnut top connects with the dark wood veneer cabinetry finishes in the kitchen."